The Contest commences at 12:01am (ET) on February 1, 2009 and ends at 11:59pm (ET) on June 1, 2009. No purchase is necessary. Chances of winning are 1 in 12. Each winner will be contacted within 5 business days, to receive a free VoiceGear software license with 4 concurrent lines. Winners that can not be reached within 14 days of winning, using contact information provided with Contest submission, will forfeit their right to claim a prize. Duplicate Contest submissions will be disqualified from participation. Step 1 - "Install Your Free VoiceGear Software CD"
This is a quick guide for installing VoiceGear Connect 3.0 software on existing computer systems from a bootable VoiceGear CD. Estimated time to complete this installation procedure is 30 minutes. The installation procedure is fully automated, and requires only 10 minutes of your time. No expert skills are required. Before proceeding with the installation please make sure your computer and Internet connection conform to minimum requirements shown below. VoiceGear Connect 3.0 installation procedure is extremely easy to follow. For your convenience, the entire installation process is outlined below in 12 quick steps, which should take approximately 30 minutes to complete. Insert VoiceGear Connect 3.0 CD into your CD-ROM drive, restart the computer and make sure your computer is set to auto-boot from CD-ROM. For analog or ISDN PBX integration, please make sure the computer has appropriate Sangoma hardware installed prior to inserting the CD. For analog connectivity it is recommended to use Sangoma A200 PCI cards. For PRI connectivity it is recommended to use Sangoma A10x ISDN cards. Select "Install VoiceGear Connect" from the initial "VoiceGear Installer" screen and press the "Enter" key twice to start the guided installation procedure. The installer will prompt you to automatically detect the keyboard layout of your system. Select "No" and press "Enter" to view the list of available keyboard origins. Select the keyboard origin that is the most appropriate for your region and press "Enter" to display the list of matching keyboard layouts. Select the keyboard layout that is the most appropriate for your region and press "Enter" to proceed with the installation. For North American installations, you can safely accept default values of "USA" for both keyboard origin and keyboard layout settings. The installer will prompt you to partition your hard drive in order to install VoiceGear Connect 3.0. Select the desired hard disk and press "Enter". Installer will automatically determine partition sizes and ask for your confirmation. Select "Yes" and press "Enter" to proceed with the installation. WARNING! - Proceeding with this step will completely erase existing contents of your hard drive. The installer will automatically reboot your system and eject the CD once it is done copying necessary data. Please make sure to remove the installation CD from the CD-ROM drive in order for installation to proceed properly. At this point, installation CD will no longer be necessary. The installer will ask you to read and agree to the VoiceGear EULA. To show the agreement, select "OK" and press "Enter". To scroll down the license agreement, press "Space" key which will show the next page of the agreement. Once done going over the EULA, select "Yes" and press "Enter" to agree with its terms and conditions. Selecting "No" and pressing "Enter" will abort the installation. 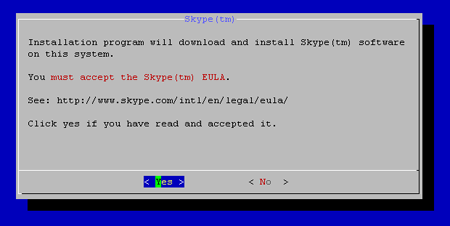 The installer will prompt you to read and accept the Skype EULA available online. Please navigate to the provided link, read the EULA, select "Yes" and press "Enter" to confirm that you agree with its terms and conditions. Selecting "No" and pressing "Enter" will abort the installation. On the next installer screen, please select "OK" and press "Enter" to continue. Depending if you are installing VoiceGear Connect 3.0 on a physical or virtual machine, you will need to select a different "System Mode" for the installation to continue. Using keyboard arrow keys and spacebar, select "real" option if installing on a physical machine or "vm" option if installing on a virtual machine such as VMWare. To proceed with the installation, select "OK" and press "Enter". To confirm your selection, select "Yes" and press "Enter" on the next installer screen. ATTENTION! 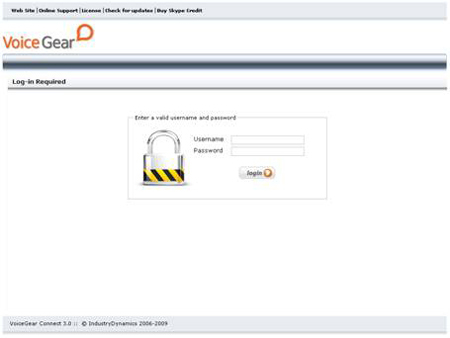 - It is strongly recommended to install VoiceGear Connect on a physical machine for use in production environments. After processing additional system packages, the installer will auto-detect your network hardware and prompt you to configure network settings. To configure network settings, use keyboard arrow keys to select "eth0" from the list and press "Enter". If your network supports DHCP and is configured to lease IP addresses infinitely, select "Yes" and press "Enter" on the next screen. Alternatively, it is recommended to configure static IP information by selecting "No" and pressing "Enter" on the next screen shown below. The system will prompt you to input static IP address, netmask, and gateway address in order to complete static IP configuration. As a rule, this information can be requested from a network admin. Once finished with the static IP configuration, select "Yes" and press "Enter" to confirm your selection. To proceed with the installation, use keyboard arrow keys to select "Configuration finished" option from the list, select "OK" and press "Enter". The installer will automatically perform a network configuration test and will proceed with the installation upon its success. ATTENTION! - Incorrect network configuration or static IP assignment will be detected by the installer and you will have an option to modify your configuration before proceeding. Upon successful network configuration, installer will start configuring third party components which can take up to 15 minutes. The screen will be continuously updated with the current progress. When finished with third-party component configuration, the installer will prompt you to select the default shell for the system console. It is strongly recommended to select "Yes" and press "Enter". At this point, your computer will reboot to finalize the installation. Step 2 - "Obtain Your License Request Code"
After the installation has been completed and the system restarts, please open a Web browser on any computer connected to the same network as the system where VoiceGear Connect has been installed and navigate to the following address: http://0.0.0.0:8080 where "0.0.0.0" is the current IP of the VoiceGear Connect system assigned either by DHCP or manually configured in the installation step ten. In order to login to the Web configuration interface, please use "admin" both as your username and password. Your current VoiceGear Connect installation is a fully functional product limited to 2 concurrent calls and 60 second maximum call duration. To remove these restrictions you need to apply a valid license key, which can be requested from IndustryDynamics. 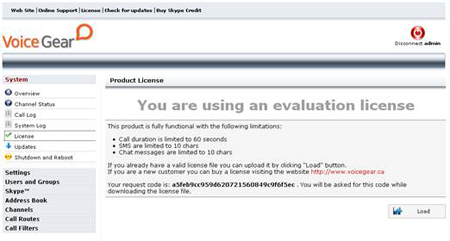 In order to obtain a valid license key, please send your License Request Code to sales@industrydynamics.ca. You can find this code by navigating to the "System->License" screen from the main menu on the left. For more information on configuring and using VoiceGear Connect, please refer to the "VoiceGear Connect User Guide" available at http://industrydynamics.ca/downloads.php#manuals. Step 3 - "Submit Your License Request Code for a Chance to Win a Free License"